Summer is here and with it, the nice warm weather and you want to be outside enjoying it! Here are some tips for staying cool while breastfeeding in the summer heat. Choose your location: Find a nice shaded area under a tree, awning or umbrella. Areas in the shade are much cooler than sitting in the hot sun. If the shade is still too hot, you may want to find a nearby location with air conditioning where you and baby can cool off while nursing. You can always go and buy yourself a cool drink and sit in a café or restaurant to stay cool while you nurse. In Canada and most of the United States you are protected by law and can breastfeed in any location you are (legally) allowed to be; so if you are in a comfortable place to nurse- go for it! Create your own breeze: You can make your own folded fan or purchase one to provide you and baby with a breeze. Many dollar stores have little paper fans available as well as battery operated fans which provide a small breeze without so much arm movement. Avoid the HOT afternoon sun: If possible avoid the hottest part of the day between 1-4pm. This may be a good time for you and baby to nap indoors. Sweaty skin to skin: Skin to skin is great for Mom and Baby, but in the heat it may become uncomfortable for both of you. Placing a thin layer between you and baby may make you both more comfortable: a thin cotton or even dry fit material. This may help keep you cooler, or at least less sticky-sweaty. 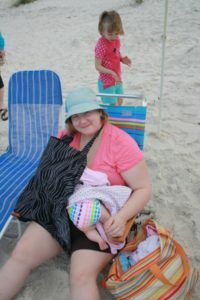 Avoid the cover: Wearing a nursing cover can be hot for Mom and Baby indoors, outside in the heat it may be intolerable! You can use different clothing options if you are concerned about what is showing while nursing or choose a thin nursing cover made of breathable material. If you have a muslin cotton blanket these can be great as a cover, and the moving air can flows right through it. WATER! : It is important for a nursing Mother to stay hydrated especially in the heat, so don’t forget to bring drinks for you. A breastfeeding baby does not need any additional water. Breastmilk is over 85% water and keeps baby hydrated while providing all of their essential nutrients. Water will fill their tummy up without providing nutrition. Your breastmilk is all they need.